CubeBackup - How to backup G Suite data to Amazon S3? How to backup G Suite data to Amazon S3? Amazon S3 is a very affordable and flexible storage solution. It is probably the most-widely used cloud storage solution due to its highly scalability, flexibility, reliability and security. It is especially ideal for storing archived data. Some G Suite cloud-to-cloud backup solutions act as a middle-man between Google’s servers and the cloud storage provider (such as Amazon S3). All of your data is stored in the vendor’s own storage with the cloud provider, so the vendor becomes the gatekeeper of your backup data, and all access to your data must be through them. CubeBackup, on the other hand, leaves you in control of your data. Using Google APIs and Amazon APIs, CubeBackup allows you to back up your G Suite data to your own private Amazon S3 bucket directly, without acting as a middle-man. You retain control of the Amazon S3 bucket and all of your data without exposing it to any third parties. This allows you to view the physical files and folders of your backups, so you can copy or migrate the backup data to other storage locations if you wish. 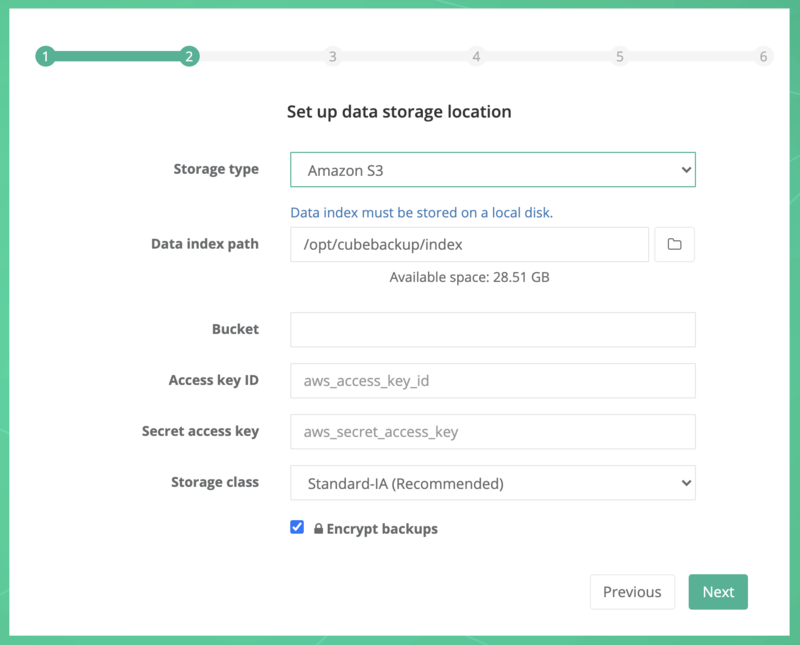 Since CubeBackup leaves control of the Amazon S3 storage in your hands, you will need to create an AWS account on Amazon and apply for an S3 bucket. For more information, please visit https://aws.amazon.com/s3. Backup data migration Yes (very easy) It depends, some vendors offer data migration options, others do not. Setting an Amazon S3 bucket as your backup location must be done just after the CubeBackup installation, during the initial configuration. For detailed information about how to apply for a private S3 bucket and corresponding Amazon IAM account, see Backup to Amazon S3: apply for an S3 bucket and IAM. Once you have created your Amazon IAM account and S3 bucket, during the initial configuration of CubeBackup, you can select Amazon S3 as the backup location, and then input the Bucket name, Access key ID, and Secret access key values. Please follow the Initial Configuration instructions to complete all other settings. If your backups are currently stored with CubeBackup using on-premises storage and you’d like to migrate to Amazon S3, please refer to GSuite Backup Migration. You may be concerned about the cost of using Amazon S3 for your backup data. Pricing for Amazon S3 can be found at https://aws.amazon.com/s3/pricing/. Amazon’s pricing model is somewhat complicated, but we have found that, on average, the cost is about $5/year for each user. Note: The cost of Amazon S3 storage may vary depending on how much data each user has on G Suite. These estimated prices assume that each user has 30 GB data on average. By default, if you choose to backup G Suite data to Amazon S3, CubeBackup will employ Amazon S3 Standard-IA as the backup storage.